Read Crix11 detailed and comprehensive prediction on who will win today? In Today’s Dream11 Fantasy Cricket Prediction of CSK vs SRH Final Match IPL 2018, we will cover toss prediction, likely playing 11 and pitch report of Wankhede Stadium, Mumbai. We will also cover all the latest news and updates of Chennai Super Kings vs Sunrisers Hyderabad, dream11 guru and crictom prediction, key players, weather report of Mumbai, the best choice for captain and vice-captain, dream 11 best teams, players recent and past performance, where to watch live match of SRH vs CSK and details of live streaming. All the details in this post are taken from very reliable sources. Make sure to read the complete post to get 100% benefit. We provide tips, tricks and suggestions in every section of the post. Make sure to read all the sections. All the details in this post are absolutely free of cost. You don’t have to pay a single penny. You should have the above details if you want to win in any fantasy leagues. Our strategy is very simple. We predict, the players perform and our readers win the match. Try to make your own team from the details that we provide. If you think that you will win with the same team then it’s very difficult. All the readers of crix11, who have read the complete post and then made their own teams have won in many fantasy leagues. We want you to be the next. You have almost 100% accurate data in from of you. And be the next winner. 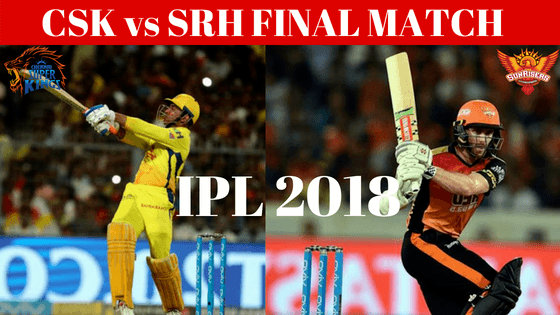 Who Will Win the Final Match of IPL 2018 Between CSK vs SRH and Toss Prediction? What is the best combination of players for Dream11 in the Final Match? Date: The match will be played on 27th May 2018 (Sunday). Mumbai, Wankhede Stadium, had a batting friendly pitch prior to the 11th Season of IPL but the pitch behave totally different. The pitch was a bit slow and sluggish. The bowlers had a great advantage from the wicket. The pitch may behave the same way in today’s match also but if the batsmen can handle the initial seam and don’t throw their wicket, they can score big. The seamers will get more help from this wicket. If we look at the record of Mumbai, Wankhede Stadium of the last 8 matches, Seamers have taken 72 wickets and the spinners have taken 27 wickets. You can get a fair idea that seamers will take more wickets as compare to the spinners. We have always told and again we are saying read the complete post as each and every section of the post has some crucial data or statistics, which will help you to make your best team. We are providing you all the details, now winning in the fantasy league is in your own hand. Note: If you know the scoring pattern, then you can easily guess what score a team can make and which team will win. We can get a big score match as after every alternate match the pitch helped the batsmen and in the last game, it helped the bowler. You are wise enough so you can understand what could be the score in today’s match. There is no threat of rain on 27th May. The sky will be clear today. The cricket fans and fantasy users can watch the full game. In the morning, it will be partly cloudy but the sky will be clear at the time the time of the play. However, it will be a sunny day before the start of the match. The temperature is expected to be 31-Degree Celsius and the humidity to be 79%, which may rise up to 81%. In the last five matches, CSK won four matches out of five matches whereas SRH won one game out of five games. In IPL 2018, Chennai Super Kings defeated all the three games they against each other. In overall encounters, HYD won two matches and CHE won seven matches. CSK has won 80% of the games and SRH has won 20% of the games. Star Sports has paid a huge amount of INR 16,347.50 Crores to get exclusive rights of IPL 2018 for live coverage for five years starting from 2018 to 2022. Star Sports has all the media rights including TV and all Digital Rights. You can watch the full match of Sunrisers Hyderabad vs Chennai Super Kings (Final) on Star Sports. Shane Watson, Ambati Rayudu, MS Dhoni (c & wk), Murali Vijay, Faf du Plessis, Lungi Ngidi, Suresh Raina, Harbhajan Singh, Dwayne Bravo, KM Asif, Ravindra Jadeja, Kshitiz Sharma, Deepak Chahar, Karn Sharma, Shardul Thakur, Dhruv Shorey, Imran Tahir, Chaitanya Bishnoi, David Willey, Sam Billings, Monu Kumar, N Jagadeesan, Kanishk Seth. Shikhar Dhawan, Wriddhiman Saha (wk), Carlos Brathwaite, Basil Thampi, Kane Williamson (c), Chris Jordan, Shakib Al Hasan, Ricky Bhui, Mehdi Hasan, Tanmay Agarwal, Deepak Hooda, Siddarth Kaul, Yusuf Pathan, Sachin Baby, Manish Pandey, Rashid Khan, T Natarajan, Bhuvneshwar Kumar, Sandeep Sharma, K Khaleel Ahmed, Shreevats Goswami, Alex Hales, Bipul Sharma, Mohammad Nabi. Sunrisers Hyderabad will play the final match against Chennai Super Kings. SRH have lost back to back games but won the last match after beating KKR. On the other hand, CSK has defeated SRH three times in this IPL. It will be interesting to see how both the teams make their playing 11 combinations. We will give you the probable playing 11 in the next section. Faf du Plessis played an outstanding inning in the last match. CSk has won their last game against SRH but they may make a couple of changes. They may give Karn Sharma a chance in place of Harbhajan Singh but this is very unlikely to happen as Dhoni has always backed Harbhajan Singh. Shane Watson, Suresh Raina, MS Dhoni (capt & wk), Ravindra Jadeja, Harbhajan Singh/Karn Sharma, Lungi Ngidi, Faf du Plessis, Ambati Rayudu, Dwayne Bravo, Shardul Thakur. Sunrisers have won their last match after losing four back to back matches. However, SRH may make a couple of changes in their playing 11. Manish Pandey may get a chance in place of Deepak Hooda and Sandeep Sharma or Basil Thampi may get a game in place of Khaleel Ahmed as Ahmed was very expensive in the previous game. Except for the above changes, HYD will play with the same playing 11. Wriddhiman Saha (wk), Kane Williamson (capt), Deepak Hooda, Carlos Brathwaite, Bhuvneshwar Kumar, Sandeep Sharma/Khaleel Ahmed/Basil Thampi, Shikhar Dhawan, Shakib Al Hasan, Yusuf Pathan, Rashid Khan, Siddarth Kaul. Pro tips: Try to take Dhoni as he is in good form. 66.62% of the users have selected Dhoni in their dream11 fantasy teams and 31.5% of the users have taken Saha in their teams. Make a combination of the above players for multiple teams. For the 6th time in IPL history, the two teams who topped the table in the league stages have reached the finals. The most interesting part is the team who finished at the second position in the league’s stage have won four times. So if we look at this trend CSK will win the match. According to our astrology prediction, Chennai Super Kings will win the match. The team winning the toss should opt to bowl first as dew will come into the play in the latter half of the game and it will make chasing easy for the team batting second. According to our astrology prediction, CSK will win the toss and they will ask SRH to bat first. Try to keep all the three all-rounders in your team as they can contribute you the maximum points. Raina has an impressive record in the IPL finals. He has scored 209 runs with an average of 41.80. Taking Shakib and Jadeja in your teams would be a wise choice as they are in good touch with the bowl. You can take Bhuvneshwar Kumar in your team as he got the swing in the previous match they played against each other in Mumbai. Rayudu has scored 385 runs against SRH. Conclusion: This is it for Today’s Dream11 Fantasy Cricket Match Prediction of CSK vs SRH, Final Match, T20 Match, IPL 2018 which will be played on Sunday 27th May. You can give your valuable feedback in the comment section. Subscribe to our notification of latest updates. GOODBYE!